EarthTalk: Atmospheric CO2 – Is it Too Late Anyway? McKibben, whose 1989 book The End of Nature detailed the potential effects of climate change and remains one of the most influential environmental books of all time, believes that 350 ppm is attainable. “Scrambling back” will entail nothing short of transforming our energy infrastructure, including how we transport people and goods and power our structures. 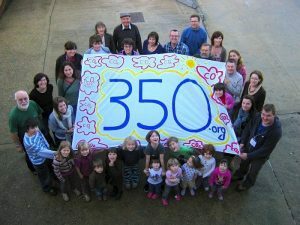 According to 350.org, it means building solar arrays instead of coal plants, planting trees instead of cutting forests, increasing energy efficiency and reducing waste.